As my wife is Dutch and I've been living in the Netherlands for a few years now, discussions over furniture design, aesthetics, style and form are always interesting. The Dutch have a wonderfully adventurous taste in furniture, architecture and form, and as a nation they take great care on interior design. My background being from rural North Wales and a natural lover of old Welsh cottages, dressers and John Brown stick chairs is somewhat counter that, but my collection of furniture from Tim Stead has won my wife over a little to that naturalistic form of furniture, utilising the natural shapes, surprises and colours a locally cut waney board can offer. So we had many a long and involved discussion on how the cabinet would look, and as my wife spends a lot more time in the house than I do, her input at the design stage was and is vital. Having said all this somehow the idea of a TV cabinet arose. Initially we thought of placing the TV within it but with the trend to wide screen TVs, proportionally that would make the cabinet too large for the room. So with an eye on buying a flat screen TV sometime in the future, the cabinet would host the TV temporally on it’s top, and then once we built a place to hold a flat screen, the cabinet must be able to stand on it’s own as a piece of decorative yet functional furniture. 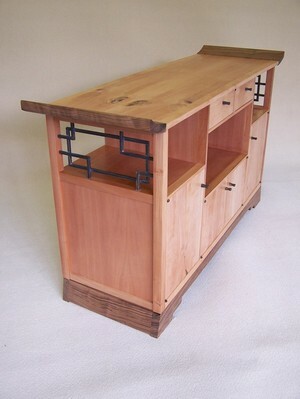 Our Dutch house is full of stylised Art Deco forms and pouring over ideas in books, magazines and chatting to my many fellow hobby/professional furniture makers on the UKWorkshop discussion forum, the idea of a Japanese style cabinet was formed, using contrasting woods, and patinated brass fittings. A tea pot from a local Japanese shop gave us the idea of building the cabinet wings at a higher angle than you see on other Japanese styles, and the steps of the foot mimic the leaded glass styling of our house. 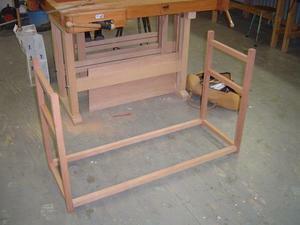 I’m lucky to be a student of Hans Koot a fine furniture maker from near Arnhem and I attend his workshop regularly. His style of teaching is very relaxed and supportive, when you first start he teaches you the basics of hand work and machine work, and then as you develop onto projects, he supports you in what you want to do guiding and helping and not overly leading nor pushing. It is a very relaxed style of learning that suits me very much. Hans and the fellow students there have helped me develop the cabinet and the design and I’m greatly indebted to them. The choice of wood came from reading James Krenov, he uses pear so much and there is a good supply at my local fine wood dealership I thought I would try. The steamed Swiss pear was very easy to work, except it has the tendency to split a little after being machined. 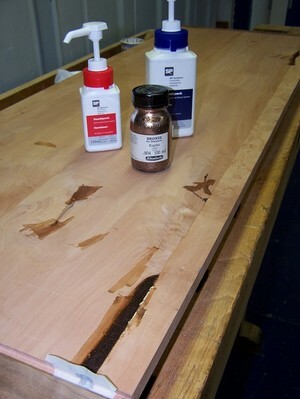 But the wonderful colours that appeared once the waney boards were dimensioned were just delightful. This is where my love of Tim Stead’s furniture came to dominate a little, and we decided to cut 2mm veneer from the more colourful boards to front the doors, and a fault that appeared in the boards I intended to used for the book matched cabinet top would be filled using bronze filled epoxy, a technique Tim uses to highlight and enhance natural faults in wood. Although it took a few attempts to perfect this technique we are delighted with the result. Solid pear also made up the frame of the cabinet with hand cut haunched mortise and tenons joints, but this time utilising the pieces of the tree that were more uniform and linear in colour and grain, so as to counteract against the doors. The decision to used veneered multiplex , was not only from the stability of the wood considerations but also leans towards the Dutch nations love of contemporary design, this straight angular form gives the cabinet, we hope, an up to date feeling as it was not our intention to make an modern antique. The frame was built quite quickly and then followed the long process of making the veneered muliplex panels and lipping them with a 30mm thick piece of solid pear (the same thickness of the frame). Lipping them with such a large pieces of pear, came from a suggestion by Hans and really adds to the overall synergy of the piece, allowing the panels to flow into the frame without any discontinuities. We simply jointed these panels together, and to the frame, using biscuit joints, a simple method whose invisible joint does not distract from the piece I feel. 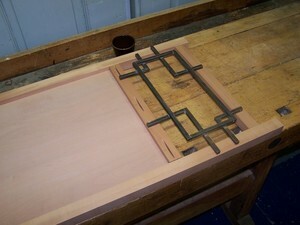 The slots for the knife hinges were routed into place prior to this to ease the construction. The end panels of the cabinet host book matched veneers which again are quite uniform in colour and grain, I really wanted the doors to catch the eye. The brass forms on the end panels was simply soldered together and then patinated, mortises cut into the frame and inserted prior to gluing up the end panels. This was my first attempt at soldering brass and was surprisingly easy to do, you just need to ensure you cuts are at 90 degrees (thanks to my Ulmia mitre saw) and you have a simple 90 deg clamp (1.5€ from the local DIY shop). I decided to finish the pieces prior to gluing them as I felt it would be easier and result in a far superior finish. The finish is satin gel varnish, this has to be applied very thin and wiped in at great speed on pear, otherwise it will penetrate too much and give some blotching, once I had mastered this technique, the 4 coats it has were completed without too much trouble. The foot was made using steamed European walnut and again simply biscuit jointed together, it had so much a wonderful ripple, I took another 2mm veneer from it to make the side pieces of the foot match. 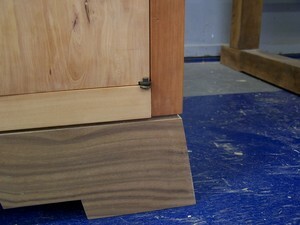 The cabinet sits on the foot with 4 locating blocks, it utilises the weight of the cabinet to keep it in position. I relieved the edge of the foot with a rebate as the cabinet has a slight 1mm twist in the front lower edge, which was very noticeable, but once the 5mm rebate was cut using the router, this hid this small problem wonderfully (again the experience of Hans was vital here). The initial idea was to use wenge to make the foot but upon planning the wood we had a change of mind as it looked too 1970’s, Boney M (a Dutch band if you didn’t know) tunes were prompted into my mind as I saw the grain wenge and so that somewhat killed that good idea! I hand made the wings for the end of the cabinet using old wooden moulding planes, and a scraper blade cut to the inner convex form, the walnut planed beautifully once Hans had taught me how to sharpen and hone the old planes. 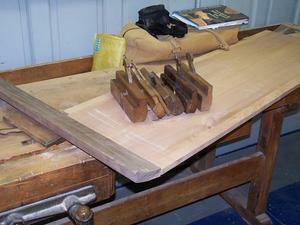 These were fitted to the top using mortise and tenons, and doweled for safety from underneath. 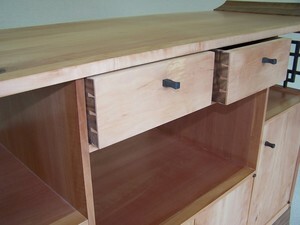 The cabinet top was fitted using steel ‘8s’ so to allow it to move a little through the seasons. The drawers were made with slips so I could keep the sides thin, and they run on Slick tape, which works surprisingly well. We had many a thought on the drawer design but thought slick tape runners would be an interesting option here. The dovetails were hand cut and the drawer sides are in walnut with the front, back and base in pear. This was purely done to show off the contrasting woods. And the joining of the old English style dovetail drawers with slips running on high tech plastic runners is a very pleasing juxtaposition albeit a technical one rather than one of styling. Placed high in the drawer separator is one of my favourite features of the cabinet, an infra red remote control repeater sensor. This picks up the IR signal and via a small amplifier hidden underneath the cabinet feeds 2 LEDs that are housed in the lower compartments to trigger the amplifier and DVD player that will be housed there. The doors were sawn to within 1.5 mm on the table saw and then hand planed to size. Finally the slot for the knife hinges were routed in. After all the work cutting and planing the veneers, gluing them to the pear lipped multiplex. I was very nervous routing these on the router table, but after 6 test pieces I finally got up the nerve to try and all went well. My wife and I struggled to find nice fittings door the cabinet so eventually after what seemed months of looking we decided I should try and make my own using what was left of the 10mm square section brass. I simply held it to a drum sander on all 4 sides, then mitred the front edges on the disc sander. The based was drilled and tapped and finally the pulls were again patinated to match the hinges and brass end pieces. Such a simple design works well and looks the part. 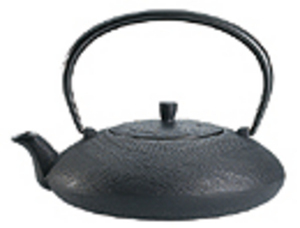 During the whole constructional period I had constant help and advice on techniques, tools and suppliers from all the members of the wonderful UKWorkshop discussion forum, I cannot praise these people enough whom very happily accommodate naive hobbyists like myself, as well as professional furniture makers. Such resources are wonderful advertisement of the power of the internet to facilitate communication, learning and social cohesion. It was within the UKWokshop that I saw the competition they were running with The Woodworker and Woodturner magazine, whose theme was the use of man made materials. So I entered and to my cabinet and to my great surprise won the advanced section. This is as much a recognition of the talents of Hans Koot and my fellow course members and that of the open helpfulness UKWorkshop members than it is of me.